ThunderB UAV is launched using a pneumatic launcher system. Image courtesy of CONTROP Precision Technologies Ltd. The UAV integrates T-STAMP EO/IR miniature payload. Image courtesy of CONTROP Precision Technologies Ltd.
A ThunderB UAV on display at the Paris Air Show 2013. ThunderB is a small tactical unmanned aerial vehicle (UAV) developed by Israeli company BlueBird Aero Systems. The compact UAV is designed to offer long endurance and extended range capabilities similar to those offered by larger unmanned aircraft weighing 200kg. The UAV can be deployed in intelligence, surveillance, target acquisition and reconnaissance (ISTAR), military, peace keeping, force / convoy protection, disaster control and management, security, law enforcement, search and rescue (SAR), and commercial missions. 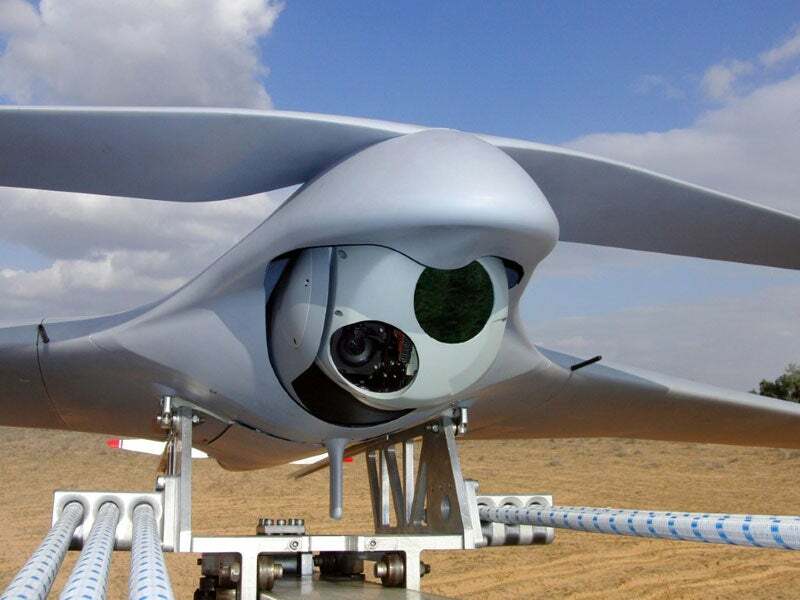 BlueBird Aero Systems unveiled its ThunderB UAV integrated with a new high-definition (HD) surveillance sensor and a communications payload supplied by Controp Precision Technologies, in September. The new payload allows the UAV to transmit HD video to the ground station. The UAV was earlier displayed at Eurosatory 2016. The ThunderB is a high-wing UAV integrating a V-shaped tail and housing a gimballed payload unit in the forward section of its fuselage. The UAV lacks a landing gear as it is recovered using a parachute system. The UAV has a length of 190cm, wing span of 400cm and maximum take-off weight (MTOW) of 28kg. It can be easily deployed from small vehicles and trailers for quick operational readiness, and offers low acoustic and visual signatures. The UAV can carry up to 3.5kg of payload in its nose section. It accommodates a T-STAMP triple sensor payload including a cooled infrared (IR) camera, a day camera and an optional laser pointer. It can be installed with gyro stabilised photogrammetric payloads to capture high-resolution imagery for mapping. The fully autonomous UAV offers dual take-off and landing capabilities. It is launched by a pneumatic launcher and can be recovered in the field by a parachute and an airbag. The digital link and antenna enable UAV to be commanded within the range of 100km. ThunderB’s counter-jamming capabilities further enable operations in communications jamming and GPS-denied environments. The aircraft is also provided with an emergency back-up control link. ThunderB is controlled by a portable ground control station (PGCS), which is also used for all UAVs of Bluebird. The PGCS provides current location of the UAV, live stream video and essential flight parameters, and allows the operator to control the UAV through a computer, external switches and joystick. "The UAV can be deployed in intelligence, surveillance, target acquisition and reconnaissance (ISTAR), military, peace keeping, force / convoy protection, disaster control and management, security, law enforcement, search and rescue (SAR), and commercial missions." The PGCS comprises an integrated control unit (ICU), ground data terminal (GDT) and emergency control unit (ECU), and can be carried by a single operator in a bag. The hand-held ECU controls the UAV in emergency conditions. The ECU uses a low bandwidth, redundant frequency link to execute pre-flights checks, return home function and pre-programmed pattern. The remote video terminal presents the real-time imagery transmitted by the UAV, location of the UAV and the payload line of sight on a moving map. It provides frontline forces with improved situational awareness and targeting capabilities. The ThunderB UAV is powered by a digital electronic fuel injection (EFI) engine driving a pusher propeller. The power-plant provides a maximum speed of 74kt and a cruise speed of 42kt. The UAV can fly at a maximum altitude of 16,000ft and can attain a maximum endurance of 24 hours depending on the payload configuration. It has an operational range of 100km, which can be extended up to 150km.